Tokyo Otaku Mode™ and Namie Amuro Collaboration Brings “AMUROCH☆USAVICH” Frames to Otaku Camera! TOKYO – Tokyo Otaku Mode Inc. (TOM) is featuring “AMUROCH☆USAVICH,” a collaboration between Japanese singer and dancer Namie Amuro and MTV Japan’s original short animation series “Usavich,” on its smartphone app Otaku Camera beginning on May 21, 2013. 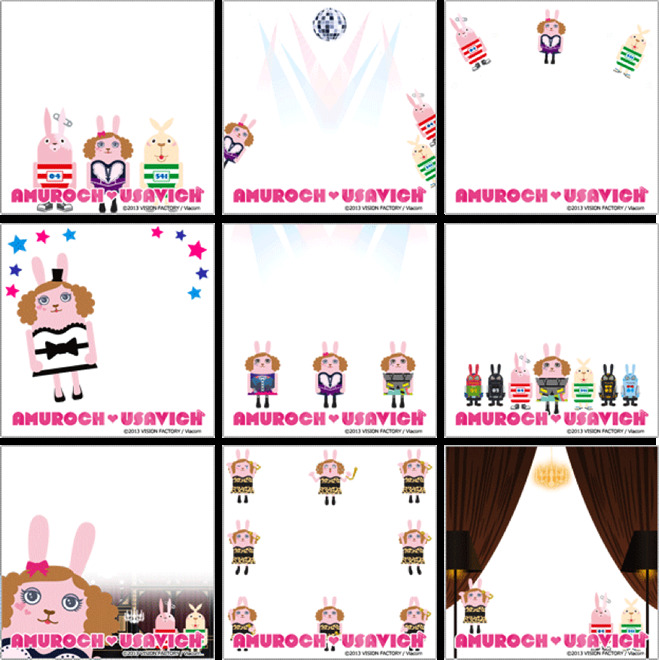 With this collaboration, Otaku Camera users can take pictures with Amuroch and Usavich using nine full-color frames. The frames are available worldwide on the Otaku Camera app via iTunes Store® and Google Play™ free of charge for a limited time until July 31, 2013. TOM presents this special feature as part of a collaborative project with Amuro, which highlights her remarkable presence and influence on J-pop and otaku culture. TOM will publish a special four-part interview series with Amuro on its news page (http://otakumode.com/news), which is part of its online site, Tokyo Otaku Mode β. One of the articles will give an inside look at the “AMUROCH☆USAVICH” collaboration on Otaku Camera. Amuro and other J-pop artists have been introduced to the worldwide otaku community through Japanese anime songs, and many otaku enthusiasts around the world are now more familiar with the Japanese pop culture entertainment scene because of this. This collaboration with Amuro is the first of many such projects to come between TOM and J-pop artists. TOM, as a leading Japanese entertainment media platform, aims to provide a wide range of Japanese entertainment news for both otaku and J-pop fans worldwide. Namie Amuro is a Japanese singer and dancer from Okinawa, Japan who was born on Sept. 20, 1977. Amuro started her career in 1992 with the group SuperMonkeys and debuted as a solo singer in 1995. Named the most successful Japanese female singer of all time, she has sold over 37 million records, and she still remains one of the most popular and best selling singers even to this day. Amuro is also one of the most well-known Asian female artists around the world. She was the first female artist from Asia to appear on stage at the World Music Awards in 2010. She has also provided her music to a variety of popular anime movies and TV shows, including “Toi et Moi” for “Pokémon: The Movie 2000” (1999), “Come” for the TV series “InuYasha” (2003), “Four Seasons” for “InuYasha the Movie: Swords of an Honorable Ruler” (2003), and “Fight Together” for the TV series “One Piece” (2011). Otaku Camera is a smartphone app that launched for iOS in November 2012 and for AndroidTM in December 2012. The app allows users to mangatize any pictures from their mobile devices. With over 100* unique frames, users can create one-of-a-kind, manga-style graphic art. The app offers many special frames that feature anime, manga, and other famous characters. Reaching over 3 million* downloads, Otaku Camera has ranked high in smartphone camera app reviews around the world. Choose from over 100* frames. Multilingual frames are available in English, Japanese, Chinese, and Spanish. Tokyo Otaku Mode™ (TOM) is a worldwide distributor of otaku content, including anime, manga, cosplay, and otaku entertainment news. Owned and managed by Tokyo Otaku Mode Inc., which was incorporated in Delaware, U.S. in April 2012 by President and CEO Tomo Kamei, TOM has operated its Facebook page (https://www.facebook.com/tokyootakumode) since March 2011. In just two years since its launch, TOM has accumulated over 12 million* likes on Facebook, becoming the largest Facebook page operated by a Japanese company. TOM also launched its own website, Tokyo Otaku Mode β (http://otakumode.com), in 2012. The website offers otaku entertainment news articles in English and a user-generated content (UGC) platform, which TOM subscribers can upload their own self-created otaku artwork, cosplay photos, and more. *As of May 20, 2013. All company names, logos, and products are trademarks of their respective organizations.